See you next year in Reno, NV! This is where it all begins for the Air Force Enlisted Corps and their basic military training, and we are honored to present the 2016 AFSA International Convention & Professional Airmen’s Conference -- where everything is bigger and better -- join us in the great state of Texas, August 20th through the 24th. STAY WITH US AT THE GRAND HYATT: Exhibitors, sponsors and guests are encouraged to stay with us at the Grand Hyatt, San Antonio Texas starting at $120 per person, plus tax. Hotel rate is offered three days pre and post event for you to enjoy your stay. Hotel deadline for reservations is August 3, 2016.
members come together to share valuable information, discuss and ratify bylaws, review the Legislative Platform, set goals and objectives for the coming year, and celebrate all the past year’s amazing success. In addition to AFSA's general membership business, we are have the unique pleasure to introduce you to past and present military and congressional senior leaders as part of our professional development forums, and prestigious awards ceremonies. These forums consist of keynote addresses from Senior Congressional leaders and decision makers, Department of Defense and Air Force Senior & Enlisted Leadership, War Historians, Award recipients, Professional & Guest Speakers, and of course our AFSA membership and special guests. Each speaker & Honored Guest provides a rich insight to the Air Force's past, present and future. Moreover, these forums continue to build on the strong, solid foundation of activism, education and support for our Total Enlisted Corps and their families. Within our International Convention, the Air Force Sergeant’s Association hosts the Professional Airman’s Conference to support and educate service members on the issues affecting the US Air Force and our national security. The Professional Airmen’s Conferences feature participants from Military Educational Centers, supporting Military Branches and Joint Services Trainers, as well as Enlisted Leadership groups -- totaling over 1,000 active duty attendees. The Conferences feature general sessions, professional development forums, formal banquets, the Convention InfoExpo, and the AFSA M.A.S.S.C (Marines, Airmen, Soldiers, Sailors and Coasties) Transitioning Workshop and Hiring Event. Exhibiting at the AFSA International National Convention & Professional Airmen’s Conference is an excellent way to gain in-person access to the leaders in the Total Enlisted Military Force, our varied membership, and potential customers, client and partners. Attendance will help continue to build your brand recognition, generate leads and connect you with the leaders in the field. Participating in our annual convention is the perfect way to meet and greet and network to share your services and expertise, and promote your support of military members and their families. EXHIBIT, SPONSOR, OR PARTNER NOW! Download the InfoExpo Exhibitor, Sponsor, and Partnership Opportunities packet here! Semi-Finalist Alexis Gomez. 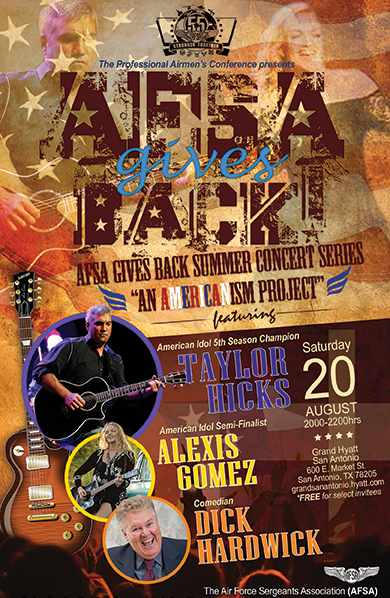 Saturday, August 20 from 8 to 10 pm at the Grand Hyatt San Antonio, Lonestar Ballroom. Admission is complimentary.